Dr. Tesla was unquestionably a prolific genius in several aspects. By 1884 he had acquired a detailed knowledge of some twelve languages while attending various European universities. His mental ability was also quite exceptional in another way because his mind could 'conjure-up' visual images to represent words spoken to him. His photographic memory coupled with his mental 'animation facility' gave him incredible advantages in problem-solving. Between 1882 and 1888, he patented many devices which employed the use of rotating magnetic fields and which produced a method of transmitting electricity with alternating currents. To those who do not realize what this means, all the world's modern electrical generation and transmission equipment is designed around the original ideas and patents of this man, Dr. Nikola Testa - who once loved the American ideal so much that he became a naturalized U.S. citizen in 1889. If the reader is like most people, his first question would be, "Who?..". It is a pity, but his name and the credit which belong to him have both been suppressed in the "interests of national security". Dr. Testa invented a unique process for generating extremely high voltages between 1889 and 1892. The type of device which he designed to generate these voltages still bears his name: The Testa Coil. During these same years, he also patented several types of isochronous oscillators. Then, between 1891 and 1893, he patented the Testa wireless (radio telegraph) system and developed 'cool process' electron tubes. Between 1896 and 1898, he published a still valid theory of radioactivity and radiated energy. During those same years, he developed high-potential vacuum tubes.. (the forerunner of all the flourescent lights the world uses today). In 1899 he presented a radio-controlled, electrically-powered submarine to the U.S. Navy... They failed to see any practical use for it and dismissed the idea! However, one of his most incredible achievements was also accomplished in 1899: and it was not rejected by the Morgans, the Rockefellers, and the Westinghouses of the world. In 1899, he published photographs and papers (to a limited readership) detailing his discovery of terrestrial resonance and the law of propagation of conduction currents through the globe. His paper also gave details of his high-potential, wireless electrical broadcasting station which broadcasted useable power - not radio communications - by transmitting energy in the form of 'standing wares' or 'stationery waves' in the Earth's crust and upper ionosphere!! During the summer of 1899, Dr. Tesla managed to construct and subsequently test one of the most incredible devices mankind has yet to see. Dr. Tesla had convinced Colonel John Jacob Astor (of Waldorf Astoria fame) to gamble $30,000 on this 'summer test'. The dry goods company named Simpson and Crawford contributed another $10,000 to the project while Mr. Leonard E. Curtis who owned the Colorado Springs Electric Company contributed both land and the use of one of his Colorado Springs power-generation plants. Tesla had chosen the Rocky Mountains for their frequent supply of highly-charged thunderstorms. It was Testa's idea to tap into these charged clouds from the ground using a tuned circuit. He had already determined that the lightning flashes from these storms seemed to discharge along a specific 'stationery wave' pattern that (he had theorized) encircled the entire globe of Earth. He built a gigantic Testa coil which used the Earth's surface as one 'plate' of a spherical capacitor to the former. He linked them with a dielectric medium: the atmosphere. 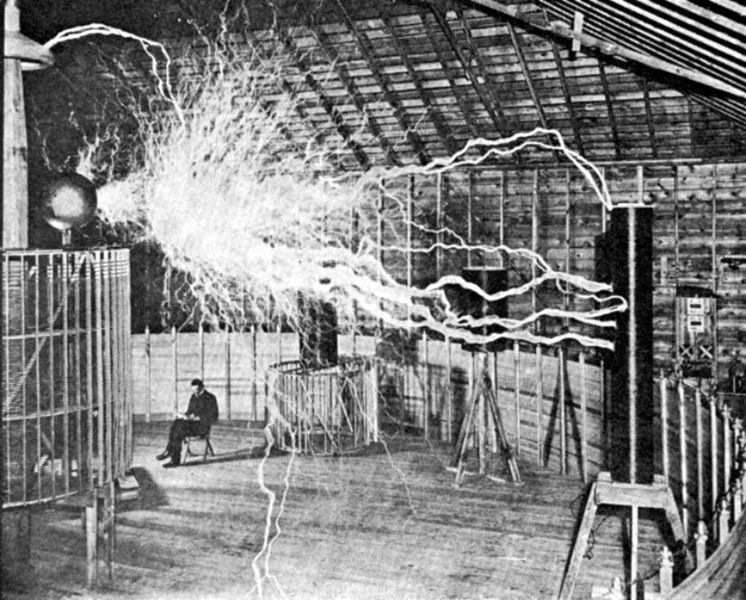 To overcome the problem of distance between the Earth and the ionosphere (which ranges from 25 miles up to 250 miles up), Tesla had aimed one end of the secondary coil of his gigantic Tesla coil at the ionosphere - the idea being that the charge-crowding effect at the ball-capped tip of the 200ft pole above the secondary would raise the effective voltage between the earth and the ionosphere. This would have had the same effect as bringing them closer. His device consisted of three main points: 1) a secondary of seventy-five turns having one end grounded into the Earth with a large copper plate and the other end attached to a 200ft tall shaft topped with a three-foot diameter ball; 2) a heavy gauge primary coil of seventy-five feet in diameter which surrounded the secondary and was inductively linked by an air gap; and 3) an electro-mechanical circuit to provide the high frequency (circa 150KC) power source to drive the primary. The interested reader is encouraged to obtain a copy of Testa's U.S. patents numbered: a) No. 649,621 of 15 May 1900 from the original specifications filed 2 September 1897 under serial No. 650,343; b) No. 685,953 of 5 November 1901 from the original application of 24 June 1899 under serial No. 62,315; c) No. 685,954 of 5 November 1901 from the original specifications filed 1 August 1899 under serial No. 62,316; d) No. 685,956 of 5 November 1901 from the original specifications filed 1 August 1899 under serial No. 725,749; e) No. 685,012 of 22 October 1901 from the original specifications filed 21 March 1900; f) No. 568,178 of 22 September 1896 from the original specifications filed 20 June 1896 under serial No. 596,262; g) No. 577,670 of 23 February 1897 from the original specifications filed 3 September 1896 under serial No. 604,723; h) No. 583,953 of 8 June 1897 from the original application filed 19 October 1896 under serial No. 609,292; and i) No. 593,138 of 2 November 1897 from the original application filed 20 March 1897 under serial No. 628,453. (note: the reader may be able to obtain all the preceding extracts in addition to about 1000 other pages of Tesla's works and writings from Health Research (unusual books department), P.O. Box 70, Mokelumne Hill, California 95245). Tesla's Colorado experiment was done at a spot very close to where this author's alma mater, the U.S. Air Force Academy, now stands. This author has spent many fascinated hours perched there some 7000 feet up the slope of 'El Diablo Mountain' (the devil mountain) watching those magnificent thunderstorms of the summer season in the 'Rockies'. It is, perhaps, for this reason that Dr. Tesla's words of 1904 concerning his highly successful Colorado test of 3 July, 1899 struck such concord in this author's own thoughts... (from the "Electrical World and Engineer" of 5 May 1904): "...I first obtained the first decisive experimental evidence of a truth for the overwhelming advancement of humanity. A dense mass of strongly charged clouds hart gathered in the West (over Pike's Peak) and toward evening a violent storm broke loose which, after spending its fury in the mountains, was driven away with great velocity over the plains. Heavy and long persistent arcs (lightning flashes) formed almost in regular time intervals... no doubt whatever, we were observing stationary waves. Subsequently similar observations were also made by my assistant, Mr. Fritz Lowenstein... (who later saw) the true nature of the wonderful phenomenon... The tremendous significance of this fact in the transmission of energy by my system had already become quite clear to me..."
"...As the source of the disturbances (which was the electrical thunderstorm) moved away discharges came successively on their nodes and loops. Impossible as it seemed, this planet despite its vast extent - behaved like a conductor of limited dimensions..."
Testa had discovered a process which could transmit almost unlimited amounts of electrical energy to any place on Earth with negligible losses. He had managed to estimate the resonant frequency of the Earth-to-ionospheric cavity at 150KC. It was a good guess; but one which has later proved not as efficient as possible because the cavity resonance changes from moment to moment - depending on solar wind densities and sunspot activity. The United States has a very low-frequency transmitter located at the South Pole. It is similar to Tesla's process - except that it can be tuned to a frequency in the range of 7Hz. Even-numbered super harmonics of this frequency such as 14,336Hz (two to the eleventh power times 7Hz) have been used by both the U.S. Navy's VLF transmitter at Australia's Northwest Cape and the American Defence Advanced Research Project Agency's VLF facility at Pine Gap in the dead centre of Australia. One must also wonder what purpose the gigantic Russian VLF transceiver at Riga on the coast of the Baltic Sea serves... For over three years now, ham radio operators all over the world have been plagued by a somewhat elusive ten to fifteen cycle "buzz" that suddenly appears across a bandwidth of over 30,000 frequencies. The signal seems to last anywhere from ten seconds to, sometimes, three minutes. Efforts to triangulate its source have always pointed to Riga... The signal is a Russian product. It seems to do nothing but jam random frequencies at random time;... but, is it simply a random jamming device? It is known that the signal travels along the same 'cavity' waveguide that Dr. Tesla's system used;... the signal also behaves somewhat like a 'beat' signal between two very low frequency signals;... yet the most amazing 'fingerprint' of this elusive signal is its excessive bandwidths. The signal must be a type of VLF, high-voltage broadcast. The 'beat' characteristic is formed as it interacts with one or more existing 'resonant-broadcast fields' around the globe. The wideband static is caused by spurious electro-magnetic radiation from 'cross-field' shorts and from leakage to Earth in the main signal. At least one other source of the 'other resonant fields' can be attributed to the United States, whose transmitters adorn the Earth in at least four places... as previously mentioned. It is quite feasible that the two 'super-powers' are having a broadcast power 'war'. This may seem a bit far-fetched to the reader; but when he is apprised of the other possible applications of such a powerful, resonant, electro-dynamic field, he will perhaps join the author in his suspicions. When a living organism is subjected to very dense and/or very rapidly changing electromagnetic fields, various physiological responses can result - dependent upon a variety of factors. In some cases, genetic malformations may occur; while in others, immediate tissue damage may result in the form of 'burns';... and yet in still others, the effects may be purely neurological causing prolonged psychotic symptoms like paranoia, depression, and hallucination. Perhaps the most 'fascinating' possibility is the use of such fields to 'model' human behaviour within the confines of the field. There would, of course, be distance limitations; but it is theoretically possible to induce subliminal suggestion, sleeplessness, and lethargy through very low frequency fields of some 10 to 15Hz...(which lie in the range of the major resonant frequency of the earth-to-ionospheric-cavity at 14.3Hz). As Dr. Tesla once observed ,...the Earth is like a gigantic, spinning ball of the electric fluid (or ether) of space... His observation would imply that an electro-magnetic 'thump' on one part of that 'ball of electric fluid' would send 'splash rings' spiralling around the planet only to meet at the antipode of the initial 'thump'. There, quite contrary to one's first thought, these 'splash rings' would not simply reflect from meeting themselves at the antipodes simply to eventually return to the source point;... not so,... not so,... for they would indeed meet at the antipodes; but the vector sums of their meetings would not be 'head-on' - as the density of the transmitting medium is not compressible. Instead of colliding, the wave fronts would actually produce a return wavefront which would then spiral back to the source like a spinning 'smoke ring' (or torroid) of energy. This redirected wave front would only partially interact with the next oncoming wave from the source. This would be due to the fact that both wavefronts would be separated by an angle somewhere between 90 and 180 degrees - depending upon the relative motion of the planet's conductive surface in contrast to the planet's spinning magnetic field. That angle between the send and return waves could also be controlled at the source by enhancing or retarding the wave pulses' spin moment. If one were to then observe the path of the energy pulses, one would perceive an immense, global grid system which would be broadcasting power around the entire world. The grid illusion would be caused by the energy-density spirals from the initial wave being overlapped by the energy-density spirals of the return wave. Two such transceivers could explain the twin 'grid networks' which Capt. Bruce Cathie discussed in his book, Harmonic 695. If such is the case, however, Capt. Cathie's grid-cell sizes appear to be in error - but only by a few miles; because, if the broadcast frequency were 14,327Hz, then the cell size would be a diamond-shaped 13 miles by 13 miles at an altitude of 158 miles and 12.5 miles by 12.5 miles at sea level. To tap the energy of such a broadcast requires the construction of a tunable Tesla coil which either operates at 14.3KHz or some even super harmonic of it. Of course, the higher the harmonic the coil is tuned to, the lower will be the power received in an inverse proportion to the increased frequency. The Testa coil's 'primary' would be the high-voltage, inner coil, in this instance, as the voltage will need to be stepped-down. The total length of the wire used in the primary should equal either the full or one quarter wavelength of the resonant harmonic chosen. The secondary should have the equivalent in ampere-turns. Placing a resistive load (like a filament light globe) across the secondary (which should be vertically movable to allow tuning of the inductive coupling of the coils) should indicate to the observer when the system is receiving by its glow. The main problem will be guessing the incoming voltage level. Depending on the field density, it could be as high at 500 Megavolts... which could produce problems... However, if the harmonic chosen is high enough, the effective voltage will drop considerably. For now, this phase of the reader's education must finish until a late publication. Very interesting! I've always been a fan of Tesla, and will be looking for much more information about his work. The Most Amazing Ancient Objects in the World?